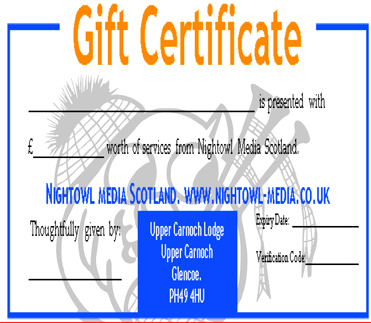 Nightowl Media Scotland now offer gift certificates which can help towards any of our services offered on our website. All gift certificates posted out to you by first class recorded delivery. If you are booking your Wedding or any other Function with us, why not ask your Guests if they would like to contribute towards the Function? 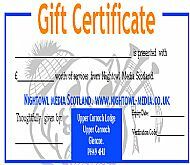 Gift certificates make an ideal gift. Payment can be made by Cheque, Bank Transfer, or Paypal.